The most basic definition of open government is the idea that people have the right to access the documents and proceedings of government. Being able to closely examine decisions, policies, and procedures is foundational to having the ability to make intelligent and informed decisions as a citizen, especially in a democracy where an informed electorate is vital if good choices are to be made by voters when selecting leaders or holding them accountable. The Open Government movement is not officially organized as a group or party, rather it is a growing collection of concerned citizens who want to help create better government by increasing citizens’ access to information. It has been heavily influenced by the open source software movement and has similar aims: increased collaboration through making options available to any interested party willing to read and study, increased transparency by making source materials freely available for anyone to peruse and examine, and increased participation by eliminating closed systems wherever possible. While this idea was broadcast most widely in the campaign and early days of Barack Obama’s presidency, this is not a one-sided political issue as much as it is an Enlightenment era system of belief, enshrined in the United States’ Declaration of Independence and Constitution, now being updated for the digital era which is filled with technologies which could make those ideals more easily fulfilled. Open Government: Collaboration, Transparency, and Participation in Practice is a collection of 34 essays written by a wide variety of people who are interested in both promoting the philosophy of open government and in suggesting practical ways to implement procedures that will assist in applying that philosophy. The range of topics covered is diverse and interesting. Included are thoughts about governmental uses of information technology that currently limit openness and specific recommendations for remedying the problems, creating a wider variety of methods for people to access government data and increasing access across society, enabling greater innovation among those not directly connected to government such as through the creation of specific APIs so that outside research may be more easily accomplished using government collected data (paid for with public funds via taxes and therefore publicly owned data). We have essays that consider new and effective ways for current government officials to communicate more easily and directly with the people who elected them, discussions of how increased openness in government could decrease the influence of monied interests in governmental policy and could replace that with a greater influence by and for the electorate. There are clear and logical presentations on topics like why using open standards for data storage matters, especially with regards to publicly owned data as collected and used by governments, as well as some great arguments for the use of open source software to make government more efficient, transparent, and flexible in a rapidly changing world. I greatly appreciate that this book exists. I would love for a copy to end up in the hands of every member of the government as well as any interested person planning to run for an office. These are policies that would greatly benefit the original intent of the founders of the United States (of which I am a citizen and where the book was written) and would be useful in any nation willing to carefully read and consider the ideas being proffered. If this topic is of any interest to you, and I argue that it should be, this book would benefit you in your thinking. Go find a copy and read it. 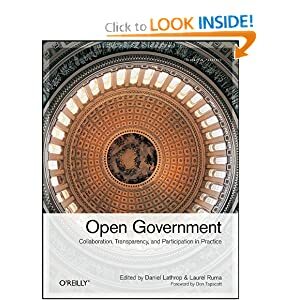 Disclosures: I was given my copy of Open Government free by O’Reilly as a review copy, I also write for O’Reilly.